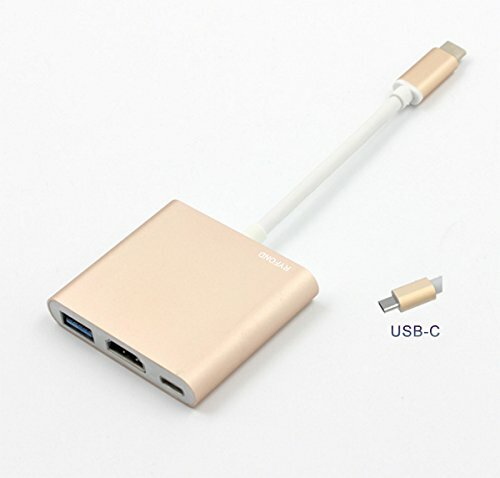 multifunction USB type c to HDMI adapter featuring the HDMI,USB 3.0 and Type C female port,this Type C to HDMI adapter allows you to connect your Type C supported computers to the devices with HDMI port and other devices with usb3.0 port,plug and play and Hot Swap. It is a great tool for your Laptop,Tablet or a part of smartphone with USB-C port. It supports video resolution up to 4K UHD (3840x2160) 30Hz,compatible with 1080P 60Hz,720P. It works with devices such as keyboard,mouse,flash drive or a USB cable for syncing and charging cellphone or other devices.Transmission speed up to 10Gbps,downward compatible with USB 2.0 and below. If you have any questions about this product by RYFOND, contact us by completing and submitting the form below. If you are looking for a specif part number, please include it with your message.